It has been so very hot here in sunny Queensland, unfortunately I have been a little slow with making cards. I am sure that once the weather cools down a little, I will be creating more. This card was made for Peter and is a beautiful pattern from one of the Stitching Sheet books they are available from Ann's Paper Art this pattern is in book 8 and the pattern number is a386. Threads are Mettler Polysheen, 0151, 0853, 3620. 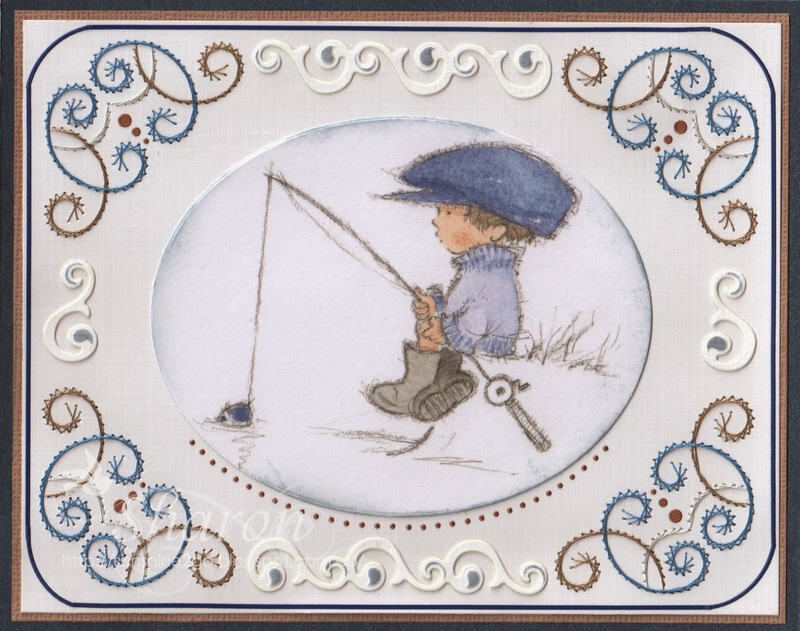 Peter loves fishing so I thought the image from Lili of the Valley was perfect, it is another one from the fantastic range of Art pads called "Vintage boys". I really love these images they are so cute. I used a Couture Creations die to cut into a oval shape which I then added some Distress ink "weathered wood" around the edge. The swirls were created with Leane Creatief 45.8107 die and once again I used weathered wood ink on the embossing. Hobbydots have been added amongst the stitching and along the edge. I would like to enter this card in this months Challenge at LOVT "Anything Goes!" I enjoyed creating this card and I hope that you like at as well. 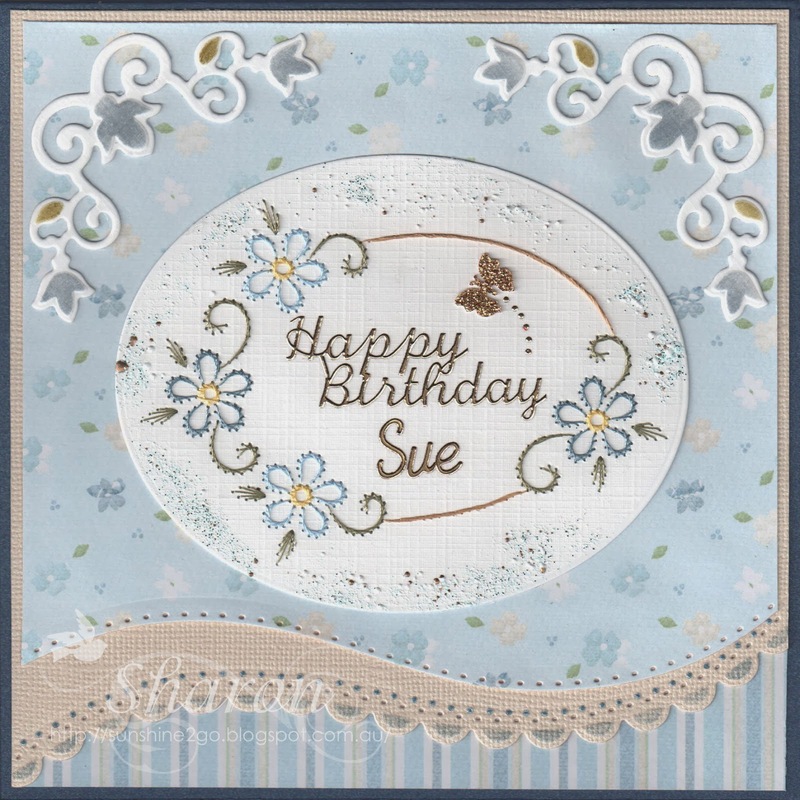 This is my very first card for 2014 and it was made for Sue (Buttons). The beautiful pattern is a447 and is available from Ann's Paper Art. Threads are Mettler Polysheen 0151, 0862,1114,6043. I reduced the pattern to fit into the Couture creations large oval. The gorgeous paper is from Lili of the Valley called Fresh Petals. with Tim Holtz, Distress Ink weather wood and forest moss. Spellbinders - Curved Boarder Two, S5-201 has made a lovely edge along the bottom of the card. I am so very pleased with the end result of this birthday card and I hope that you like it as well.